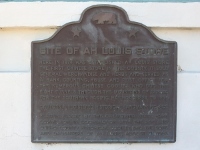 Here in 1874 was established Ah Louis' Store. 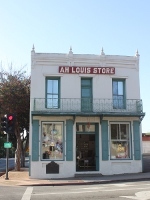 The first Chinese store in the county, it sold general merchandise and herbs and served as a bank, counting house, and post office for the numerous Chinese coolies who dug the eight tunnels through the mountains of Questa for the Southern Pacific Railroad 1884 to 1894. As of September, 2018, the site is a retail store.